Northwest Puerto Rico is the surf capital of the Caribbean with year-round waves that rival those of Hawaii. San Germán, on the other hand, is in the southwest of the island and some ten miles from the coast. Damien Morales, a driving force behind the project ‘Surf ‘n’ Fun waterpark, spoke to Blooloop about creating a destination waterpark in Puerto Rico’s second-oldest city.Visiting IAAPA Turned an Idea to a ProjectLike all municipalities in Puerto Rico, San Germán is administered by a mayor, and it was the current mayor, Isidro Negrón, who in 2009 first had the idea of developing a recreational area with a splash and kids’ zone on three acres of municipal land. After numerous meetings and many months of planning, the original idea turned into a major project when Morales and Mayor Negrón visited the 2010 IAAPA Expo.“As we visited some water parks around the island and in the US, and contacted a number of possible vendors, our plans started to grow as a Municipal Enterprise,” says Morales. 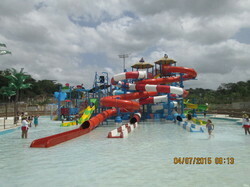 As they researched the planning, development, construction and marketing of a water park as an economic and touristic project for the Municipality, the idea grew from a 3-acre recreation area to a 21-acre major tourist attraction.A Variety of Unique Wet and Dry Attractions Attracting the leisure dollar is always a challenge, but the Surf ’n’ Fun Waterpark has much in its favor: an impressive range of both wet and dry attractions, competitive prices and excellent security. As Morales points out, it is also ideally located within easy reach of the soft sand, blue water and palm trees of Porta del Sol’s beaches.“The variety of attractions and the additional facilities include rock climbing, two sand volleyball courts, a six-lane mat-racer water slide, a thunder cruise water slide, a real sand area with a wave pool, a lazy river complete with lily pad pool, a 12 platform interactive play structure, a bungee dome, bumper boats and water wars. Arihant, international manufacturer of waterpark and playground equipment, is responsible for the installation of the Water Activity Play System, a multi-level water play structure for all ages, comprising 12 platforms and multiple slides at different levels, sprinklers, water jets and a dumping bucket which splashes into the pool. The company also installed the green and white Crazy Cruise float slide, and the six-lane mat racing slide. “Arihant has been a great partner in the development of our park, and the play structure is the biggest of its kind in the Caribbean. It is the center of all attractions, visited by thousands of users. It makes a first impression, and has the ‘wow’ factor.” Says Mr. Damian.